The nation’s top health experts say Americans consume way more salt than they should, and are pushing to get the message across with the release of new studies and new advertising campaigns. Our practice has been a part of this effort for many, many years, and offers a low-sodium diet that is low in calories and within the limits of sodium intake recommended. Two-point-three million people died from eating too much salt in 2010. A March 2013 American Heart Association report found that represents about 15 percent of deaths worldwide and about one in every 10 deaths in the U.S.
“High sodium intake is one of the major preventable causes of death and disability in our society,” says Center for Disease Control Director Dr. Thomas Frieden. According to the Center for Disease Control, DC, 90 percent of Americans eat too much sodium, consuming on average more than 3,400 milligrams a day. Less than 1500 milligrams is recommended. So if you’re one of those people who reach for the saltshaker to salt your food without tasting it first, or lean toward salty snacks like potato chips, movie theatre popcorn and salted nuts, you are not alone. “About 80 percent of all the sodium we eat comes from processed and restaurant foods. So even if you really try hard it’s hard to get down below 1,500 which is what most people actually should be consuming,” says Dr. Frieden of the CDC. Even foods we think of as low in calories and fat can be laden with excess salt, such as canned soup, tomato juice and club soda, so it’s important to be aware of the sodium content in all of your food choices and restrict the ones that are excessively high. Information on sodium is an important part of our nutrition education phase in our weight loss/ wellness practice. We encourage the diet of the whole family be modified as to sodium intake, as we are also concerned with the high level of sodium being consumed by most children as well as adults. Some of the top sources of sodium are from seemingly harmless foods, which are often staples for American kids, such as breads, cold cuts, pizza, cheese and cereal. To address this, we’ve created a low sodium diet that is easy to apply to nearly everyone’s lifestyle —whether you are trying to lose weight or just want to improve your overall health. Ask our office for more information about customizing a plan for you and your household. This week I’m teaming up with New York City fitness expert and personal trainer Tara Marie Segundo, M.A. to share our best strategies for fat loss, health & longevity. No matter what your age or current health status, it is never too late to turn your life around–and we’ll tell you how! Join us! DR. HOWARD SHAPIRO AND TARA MARIE LIVE! Today I’m expressing my continued support of NY City’s ban on large sugary drinks, and disappointment with the recent decision made by the State Supreme Court in Manhattan to block the city from putting the rules into effect. As I stated to the NY City Board of Health back in September of 2012, (covered by the NY TIMES in this article written by Vivian Yee, http://www.nytimes.com/2012/09/05/nyregion/mayors-soda-plan-backed-by-weight-loss-industry.html?_r=1&ref=nyregion), the restriction on selling supersized sodas that Mayor Michael Bloomberg wants to implement in New York city on restaurants, theatres, stadiums and street vendors, is an important step toward raising awareness of one of the issues responsible for causing increased obesity and diabetes in this country (especially among our children). This is not to say that obesity is only caused by drinking too much soda, but there is certainly a correlation between the amount of sugar we consume and our overweight status. For example, a 64-ounce supersized soda has approximately 54 teaspoons of sugar and bought at a venue will likely be consumed at one sitting. What the Mayor is doing is helping to educate people about the sugar content of sodas and the risks they impose on our health. Mayor Bloomberg is right on point. Our portion sizes are becoming ridiculous, bordering on vulgar, and the Mayor is stepping up and telling it like it is. As he did when he further exposed the dangers of smoking by instituting bans in restaurants and limiting the use of trans-fats. These changes were not popular in the beginning but are applauded by most now. We have also learned that obesity affects nearly a third of children in New York, and that New York is set to spend about $12 billion a year dealing with the adverse effects of obesity. Ands as people age, the issue becomes more difficult because of the additional health problems it creates including diabetes, heart disease, strokes and cancer, as well as debilitating back pain, joint pain, kidney disease, increased respiratory distress and many other conditions. Adult diabetes in a person by the age of 40 will cause them to lose 11-14 years of their lives. Children at the ages of 11-12 are being diagnosed with Adult Onset Diabetes, which will shorten their life span by several more years. In fact, this is the first generation of Americans predicted to have a shorter lifespan than the previous generation. It is my sincere hope that through the work of Mayor Bloomberg and other weight loss leaders including myself, people will become educated about obesity and the serious health risk factors involved. 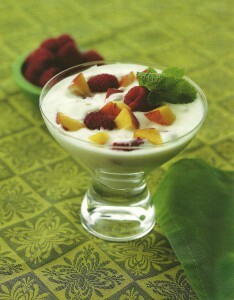 Do you find it hard to get the low-fat protein you need in the morning and satisfy your sweet tooth? Soy is the secret ingredient in this delicious, refreshing breakfast recipe–which not only provides protein but also good phytonutrients and fiber. Stir ingredients together in a mixing bowl till well blended. Refrigerate at least 30 minutes before serving. We’re killing ourselves with obesity & Type 2 Diabetes, both of which are preventable. Join host Tara Marie and Dr. Howard Shapiro, to learn about his Picture Perfect Weight Loss plan–the visual program to lose weight & regain your health once and for all. Keep the romance and lose half the calories with these yummy substitutions on Valentine’s Day. Valentine’s Day is sure to be filled with delicious and highly caloric dishes and sweets. Chocolates truffles and five-course dinners can wreak havoc on your diet, but if you have the right guide, you can be mindful of what to give, what to eat and what to avoid. For example, just eight chocolate truffles can have 560 calories, but for the same delectable taste, you can eat eight chocolate-covered strawberries for only 240 calories. If your’e going out to a restaurant to celebrate and want to indulge in dessert, you can! Just stick to a smaller portion. Keep in mind that one 4-ounce slice of chocolate layer cake and one 4-ounce slice of lemon tart both contain just 480 calories. Or, skip the restaurant dessert and save the treats for your Valentine back at home. Satisfy your sweet tooth by enjoying healthier chocolates such as Dark or Milk Chocolate Kisses, Tootsie Pops or Raisinetes. Make a delicious frozen yogurt dessert before you go out and keep it in the freezer until you get home, or heat things up next to the fire with a mug of hot cocoa. 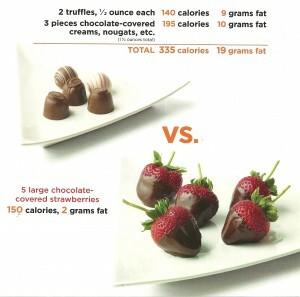 By substituting these chocolate sweets for richer candies or desserts, you could cut out more than 450 calories. Still the same romance, only half the calories. Hello. I’m Dr. Howard Shapiro. When I first came to NY about 30 years ago, I had a vision to create the most thorough, cutting edge integrated medical practice of its time—to help my patients achieve healthy weight control and life long wellness. And that includes tackling diabetes prevention and childhood obesity. As a trained MD., Osteopath and weight loss specialist, and with my team of nutritionist, psychologist, physical therapist and exercise trainers, we look at the whole body, not just the symptoms. Having an integrated medical practice allows us to customize a program to fit your needs. I’ve had the honor of working with many wonderful patients over the years, including some celebrities and New York’s Police and Fire Department. We’ve helped New York’s bravest and finest lose over 2,500 pounds, and we’re still going! I’m also the author of a best-selling book series called Picture Perfect Weight Loss, which illustrates my Food Awareness Training method with visual demonstrations, and explains my philosophy that you’re never on a diet, your participating in an ongoing process of learning to make satisfying, healthy food choices. This blog is dedicated to sharing what I’ve learned about helping people develop a healthy relationship with food. 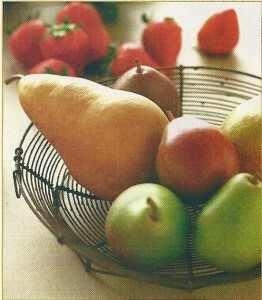 It will be full of food comparisons, tips and techniques for how to eat and loose weight, including food shopping, eating out, recipes and more. Please comment and contact us for information about a personalized health or weight loss plan. By now you have probably seen 100-calorie bags of cookies, mini-muffins, crackers, candy bites, etc. and wondered whether these are “allowable” treats. At first glance, these packs seem like an answer to every dieters prayers: the yumminess of goodies for only 100 calories and no need to worry about portion control—it’s done for you! If you had a regular box of cookies at home, it would be easy to eat half the box, and that would cost you at least 1,000 calories. Isn’t that a 900 calories savings? Yes, but while you’re probably not eating cookies on a regular basis now, the 100 calorie packs could easily become part of your eating routine. Over time, this additional 100 calories translates into almost one pound a month or 12 pounds a year. Choose a piece of fresh fruit full of healthy vitamins and antioxidants every other day instead, and quickly cut those daily snack calories in half!